The boom of online stores wasn’t really a great news to the retail industry as more customers preferred to shop online at the comfort of their homes and pajamas. But what ultimately changed the destiny of retail industry was its effort to adopt the very same technology and provide the ultimate shopping experience. 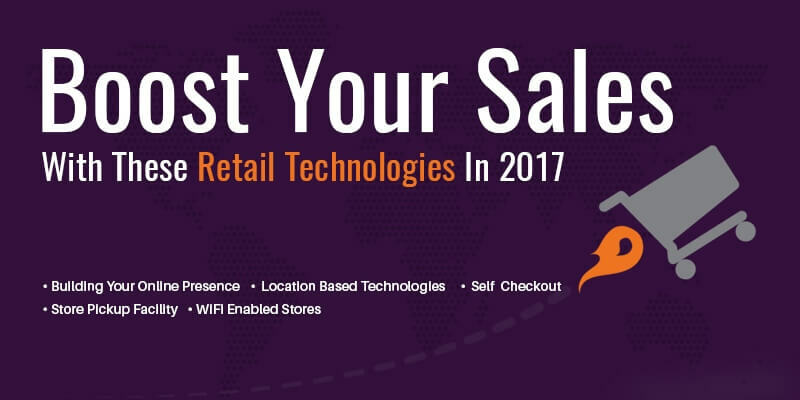 2017 has just begun and it’s never too early to discuss about how you’d want to prepare your retail store with the trending technologies. Starting from October, retailers get ready to welcome the holiday season (the peak selling part of the year). During this time, most retailers make more than 40% of their annual sales. The holiday season also puts great pressure on retailers to stay updated about the latest technologies because of the increased demand in online shopping. Over the past years, the retail industry has undergone immense evolution through various technological advancements. With omni-channel retailing strategies, retailers have realized the importance of increasing customer engagement and offering personalized shopping experience by embracing digitization. Let’s take a look at some of the retail technologies that can help you make the best of the holiday season in 2017. In today’s connected world, the need to satisfy your tech savvy customers is on the rise. Stats show that 81% of shoppers research online before they buy a product. Hence, it’s important to increase your online presence with a responsive website in order to drive the necessary traffic to your website and direct them to your store. Moreover, with the increased adoption of smartphones, it’s easier to connect with your mobile customers and let them know your exclusive holiday offers and encourage them to shop from your store. Make your customer’s purchasing decision easier by letting them experience their versatility. Smart fitting rooms with interactive mirrors and walls are connected by RFID to create an environment for customers where they can choose the product and try it along with changing the color/size options, video fitting, and changing fitting room options like special lighting effects, and much more. The Rebecca Minkoff store in New York is the perfect example of bringing about such innovative retail technological solutions. Customers love this high-end technology where it saves them a lot of time during their last minute shopping and in turn, you create happy, satisfied customers who will definitely want to make repeat purchases just to experience the perfect shopping moment. Location based technologies like Bluetooth connected Beacons have become quite popular among the retailers, especially during the holiday season. This is a boon to mobile shoppers where their mobile apps detect the beacon signals and can allow interaction with the store. Deploy beacon technology into your brick and mortar store in order to provide highly personalized offers, promotions, store maps, real time alerts on specific deals, and eventually increase your in-store traffic. The very reason for the increase of online shopping is that shoppers can shop at their comfort. With the added holiday sales rush, you can save your shoppers from waiting in long queues to complete their checkout. Recently, Amazon introduced Amazon Go store where you get connected to your Amazon account and the system automatically detects the products you pick out from the store. You can simply leave the store once you’re done and you receive your receipt from your Amazon account. Earlier, showrooming was considered as one of the biggest threats to retailers. Because, more and more shoppers spent hours in the store but ended up buying online. But with a reverse strategy, retailers could increase the number of in-store visitors. With store pickup, you can avoid unnecessary shipping charges and not wait longer to receive your product. This is again a boon to shoppers who spend a lot of time in last minute holiday shopping. During this holiday season, provide free WiFi to your shoppers because it can easily retain them in your store. Interact with them through your mobile app or mobile website. You get to study your customer’s shopping behavior which gets you plenty of customer data that can be used to send them personalized offers. You could also consider putting up self-service kiosks to help customers find products and other details easily. Most industries have begun to harness the power of data in order to produce customized products to sell better with the right audience. Ivyrevel, a fashion hub backed by H&M Group is teaming up with Google and coming up with an app that will closely monitor a user’s interest and lifestyle pattern and suggests personalized dresses. The New York Fashion Week is sure to witness such innovations that will change the apparel retail industry and enable it to blend with the latest technology for the greater benefit. These retail technologies help you to add more value to your physical store. When you equip your store digitally, it’s easier to influence your shopper’s buying decision and thereby maximize your holiday sales. Want to know more about the trending retail technologies? Contact our Magento developers today!